Craftsmen’s techniques and beauty of patterns packed together. Ise templates representing warmness of people’s hands. In the idea of tools, we delve into a variety of traditional crafts from the perspective of tools. The first time is Tokyo Somekomon. The roots of Tokyo Some Komon date back to the Muromachi period. It was originally used for armor leather and crest. Clothing was also dyed later in the Muromachi. In addition, in the Edo period, Kamishimo (one of formal dresses of samurai) began to dye. 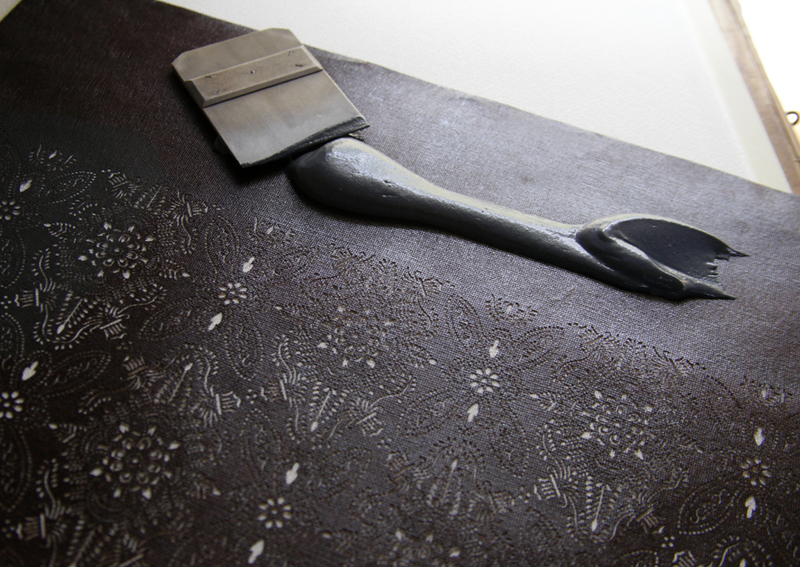 A wide variety of tools are used to produce Some-Komon, of which Ise template, also a traditional art as well, is closely linked with Some-Komon. Ise template, in that sophisticated beauty of patterns are packed together, represents excellence of craftsmen’s techniques. Skills of template engravers particularly come into play as delicate as the patterns are. Ise templates, primarily produced in Shiroko of Suzuka City, Mie Prefecture, are made with layered Mino paper with sour persimmon pasted in between, and completed by craftsmen who work out the sophisticated patterns by using carving knives designed specially for it. 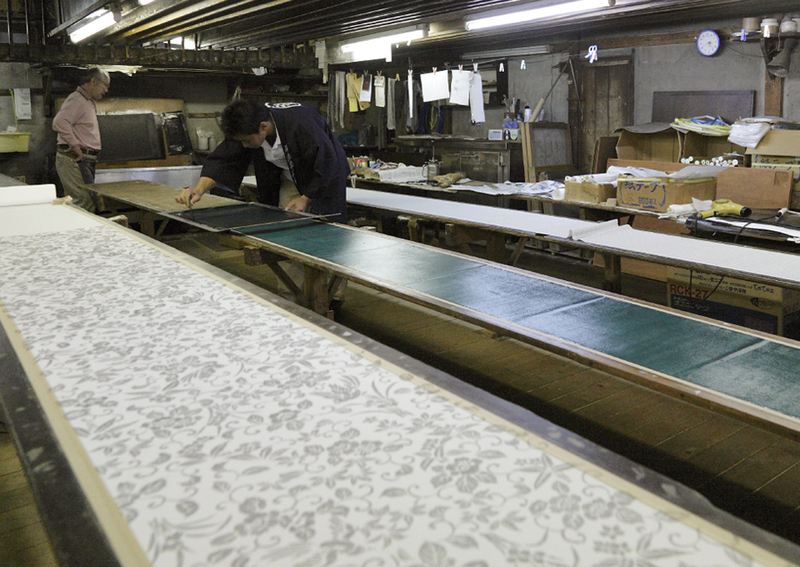 Ise templates are used not only for Edo Komon but also for dyeing process of Kata Yuzen and Yukata, and the patterns are as sophisticated as called “micro space”. 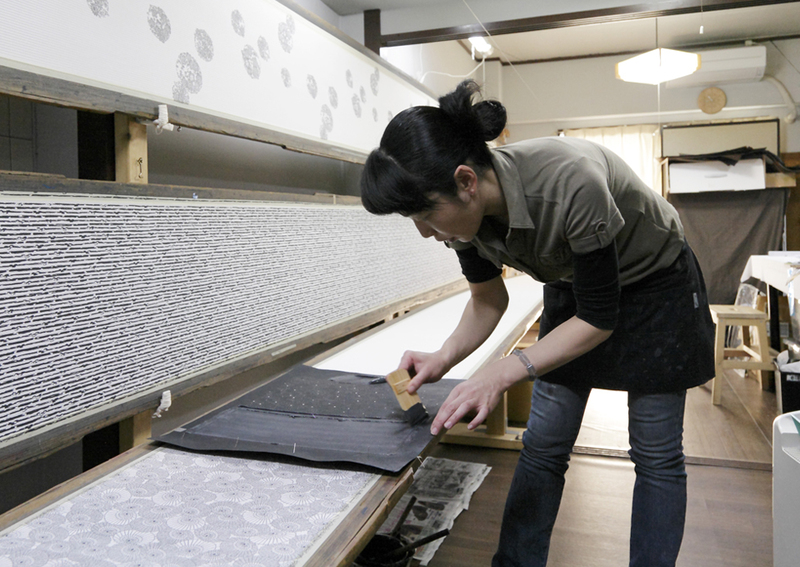 There are techniques called “Tsukibori”, “Kiribori”, Dogubori”, “Shimabori”, and 5 corresponding ones such as “Itoire” to reinforce templates for “Shimabori” and some others. All the techniques are to realize sophistication and warmness of people’s hands that machines can’t do. In recent years, the templates draw people’s attention more and more not only as dyeing tools, but also interior equipment such as for Fusuma, Ramma, Yukimi Shoji, Byobu, and art crafts. 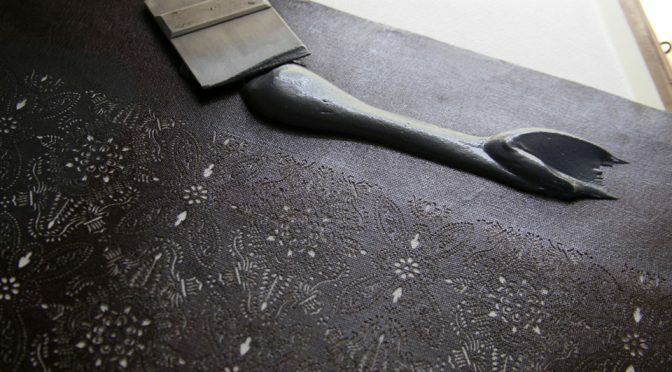 Placing a template on a white cloth, put resist paste evenly by a paddle. Different paddle comes on different patterns. An indispensable tool to produce Some-Komon. 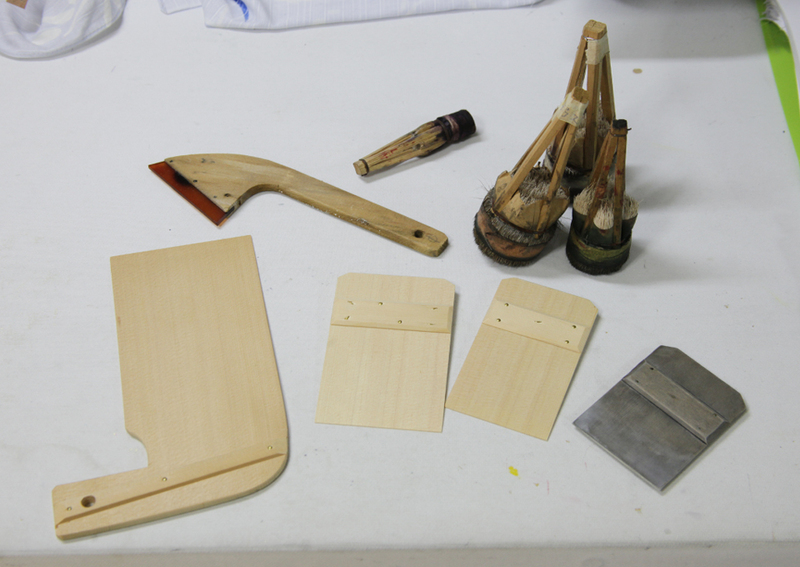 Template, and well-used paddle, that Emika Iwashita, a Traditional Craftsman, uses. Beautiful Komon patterns become real only when techniques of template engraver and dyeing craftsman come together. 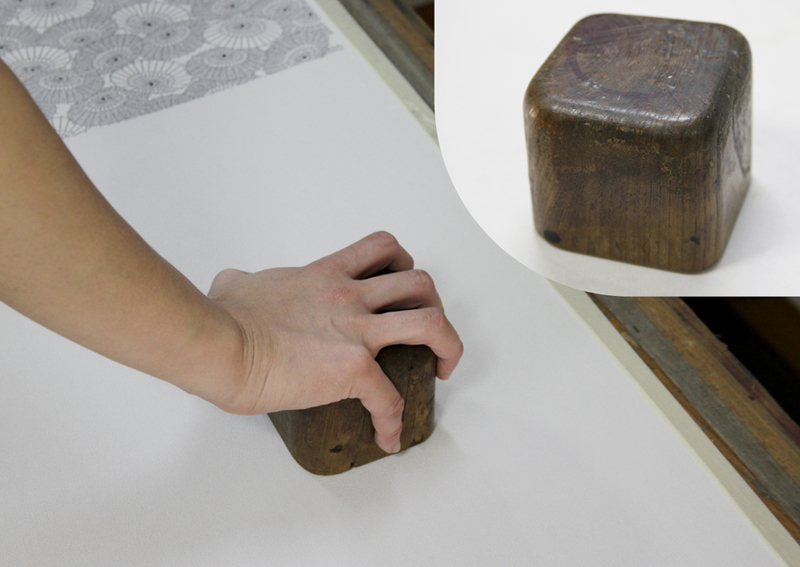 Hariita, the board which supports the job of dyeing craftsman, and color starch that affects quality of dye finish. A Hariita, in length of approx. 7 meters used to produce Edo Komon is a solid timber made of fir tree. Placing it on racks in T-shape called Uma, then cover it with a white cloth, Edo Komon is worked out. Top surface of Hariita is coated with sticky rice cake powder. The white cloth is sprayed with water, smooth out with a paddle, and wiped with a damp swabbing cloth to make it placed straightly with no wrinkles. Putting the white cloth firmly in place is an important process to respect, otherwise patterns get out of position when dyeing performed later. Putting adhesive tapes on the edges of white cloth to keep the mentioned template in position, and move onto the next process. Dyeing craftsmen typically have 7 to 8 boards like this. Shigoki process, putting a white cloth on Hariita and placing dye evenly. A paddle called Tategaki is used. 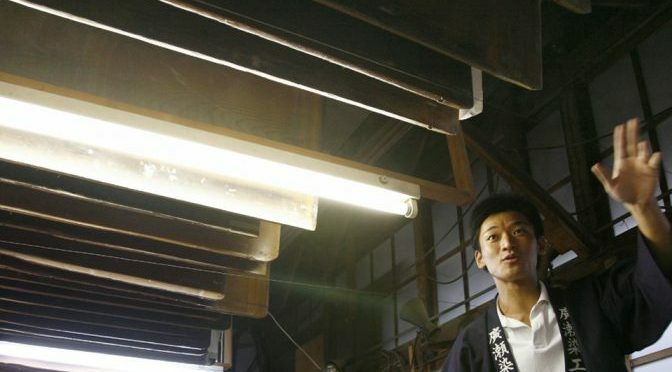 Itaba, where Hariita boards made with fir tree are hung from ceiling. Not many factories are still prepared to supply this type of boards these days. These boards are heritages from older generations. Color starch is an important element which affects quality of dye finish. It is made from rice cake powder and rice bran, in a ratio of approximately 3:7. After shaping it while pouring boiling water with salt, and steaming it in a steaming basket (Seiroh), the color starch is kneaded for adequate solidity. This becomes starch that marks base color. The starch is carefully made by mixing up different dyes to obtain single color desired and repeat test of dyeing time and time. As the color shows subtly different faces upon temperature and humidity variations, every dyeing craftsman records such data in notebook and stores by its own. Producing base color by mixing base starch and dye. 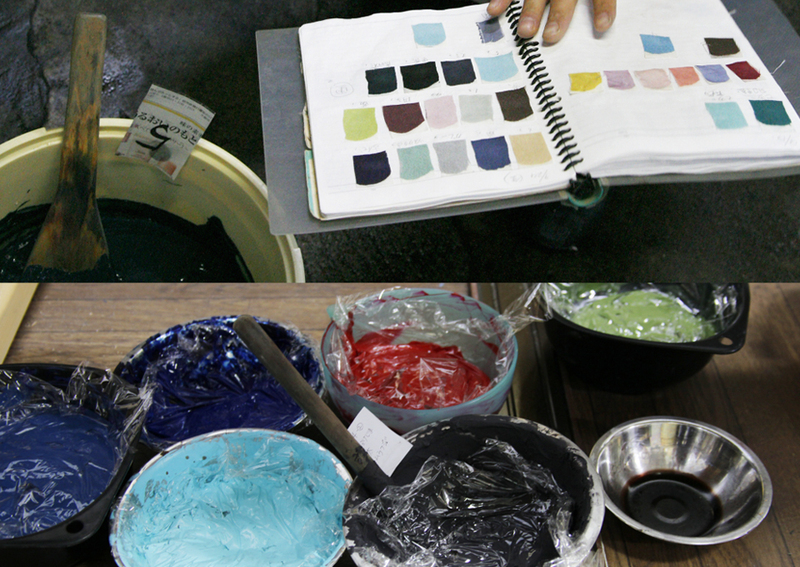 By mixing different dyes and repeat steaming test until desired color is obtained. Fitting comfortably in hand of craftsman, being inseparable as one. Dye finish by using a paddle made with fir tree. Those shown in the photo in left are some of tools used to produce Komon. The largest one, far left, is a Tategaki paddle. 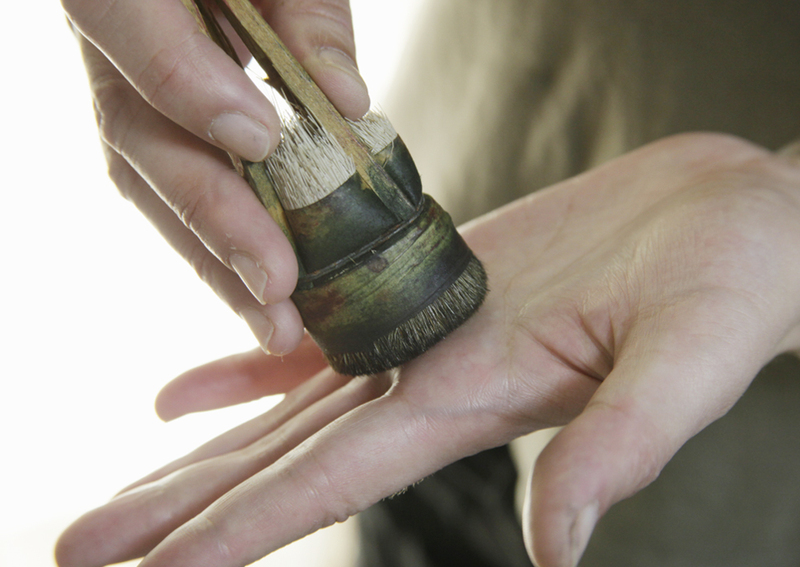 Also called Shigoki paddle, it is used to put color starch evenly and entirely. The next ones are Okoma paddles made with fir tree. Dyeing craftsmen typically choose this from many others when putting starch. The one far right is worn down because of being used throughout years. It is said that dyeing expert Yasutaka Komiya, whose father is Kosuke Komiya, started to learn how to use this paddle since summer vacation when he was 6th grade of elementary school, and used to be put through the mill by his father even on how to hold it in hand. Moving up, the one shown far left is a Deba paddle used to put starch evenly for delicate patterns. Generally, paddle to use is selected from pattern to pattern, but some craftsmen keep using only one type whichi he/she feels fit comfortably into the hand. The next ones are small and large paddles for feathering. Woven with fine deer pelage, these are used to perform feathering on patterns such as small flowers. A brush tipped with woven deer pelage, regularly used to perform feathering of colors to adjust contrast of patterns such as small flower. 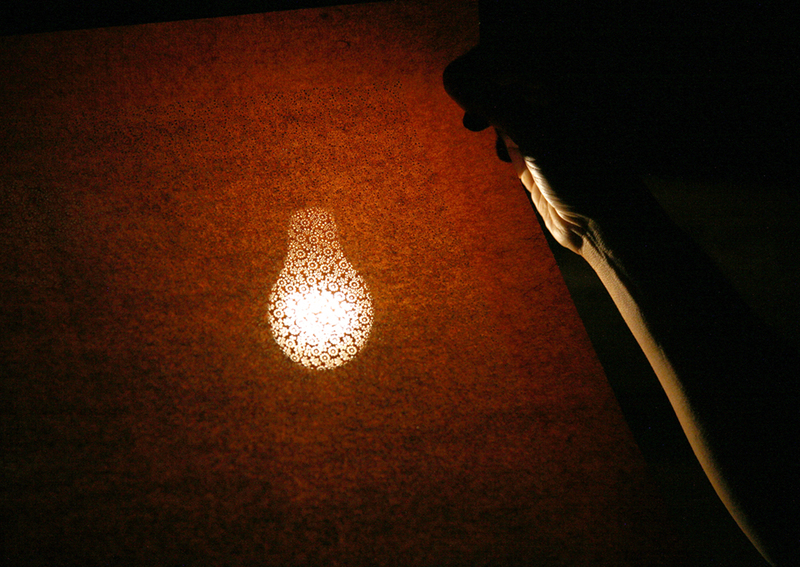 The one next is a piece of wood called Jibarigi, used to stretch white cloth. Having slided on the surface of white cloth not to allow air to come underneath, it is used to keep the cloth straight and placed firmly. Tools, that support craftsmen’s handwork. Well used throughout years, and becoming inseparable with each of craftsmen, the tools start asserting the depth of aesthetics of traditional arts and pride of the craftsmen. In “The idea of tool”, I will continue to introduce craftsmen’s tools. stay tuned! Pressing down by Jibarigi, white cloth becomes firmly placed on Hariita.